Every morning around seven as I return home after a hour's stroll in the nearby stadium,one scene I can expect without fail is Jose reading the newspaper. Jose is our faithful watchman in the house, who is as old as me.I always ensure that he is not disturbed during that time because I know very well what he enjoys then.This is not an isolated case in Kerala, the state in India where I dwell although it need not necessarily be so in rest of India......Which country leads the world in spending time in reading?Where does people read most - not in number or internet but in time spent to read serious print materials... newspapers,books, periodicals and the like? Although happy to learn this, I have to admit that initially I had my own apprehensions on the finding.While a good section remain illiterates,how a country like India with teeming millions could attain this status ?This was cleared when I did read the basis on which this survey was conducted - they have included children above 13 years old. No doubt Indian school children must be spending maximum time on books in the world for the last three decades!This is a fact myself has noticed while at Doha where I could interact with hundreds of expat parents from different countries.Notwithstanding this fact it is remarkable to see that Asian countries beat the domain in which an American or European or even an Indian never thought it would happen until turn of this century! Indian curriculum and syllabus of the school children for streams like CBSE,ICSE or some state boards at the secondary/ higher secondary level are very extensive and exhaustive.Whether one requires such a system depriving the children time for extra curricular activities or not is debatable but it remains a fact that any average plus Indian student from a good university out shines their counterparts from rest of the world in any international university entrance exam in Europe or US, leave alone their current positions as spelling bees in English in US !Along with this one has to read the fact that position held by India in last Olympics is a poor 55 among 85 participants while population wise India remains second in the world!The importance given to children's education among middle class and above in the Indian society is incomparable with others elsewhere. Interestingly although social interaction between Indian and Pakistani communities in Qatar is very less, hundreds of Pakistani children study in Indian schools where as not even single case is not there otherwise! This also reminds me sad comments made by children of one of our Indian family friends who was staying in a large housing complex years back at Doha where mostly expatriates of the west and Arab world were put up.- "Indian children will not be seen in the club, swimming pool or play grounds after early evening since they have to do the 'home work/assignments'. All others will enjoy till late evenings'"! That was probably 20 years back. Now one of the children who made those comments is a globe trotting successful Financial Executive with Goldman Sachs while the other is a qualified commercial pilot from UK!! In India thankfully in general still a well read or educated person is respected in the society regardless of the material wealth he or she holds whereas in the west or most of the Arab gulf states, society is money centered. Knowledge one commands is secondary to the wealth one has there, although in India too wind is blowing towards that state of mind, unsuccessfully so far. In India diversity is very much there in the sphere of reading in the same way it is in the society in other matters. Exception to this is state of Kerala,located on the southern tip of the country,one of the most literate states in India.Other states where reading is enjoyed by the common people are Tripura, Manipur and Nagaland- all located in the north east. Kerala's position in this respect is unique in the world. Not only it is nearly cent percent literate, it has the highest media exposure in India, for that matter may be in the world. Dozens of newspapers and periodicals are published throughout the state in local vernacular Malayalam and few in English. In spite of the advent of TV or internet, reading of hard copies-mostly covering local news- goes in the society undeterred.Whether one is a student or working or a retired pensioner or a home maker; rich , middle class or poor, reading newspaper goes along with the first cup of tea/coffee for most of them from the days I can remember!! Almost it is an addiction!! 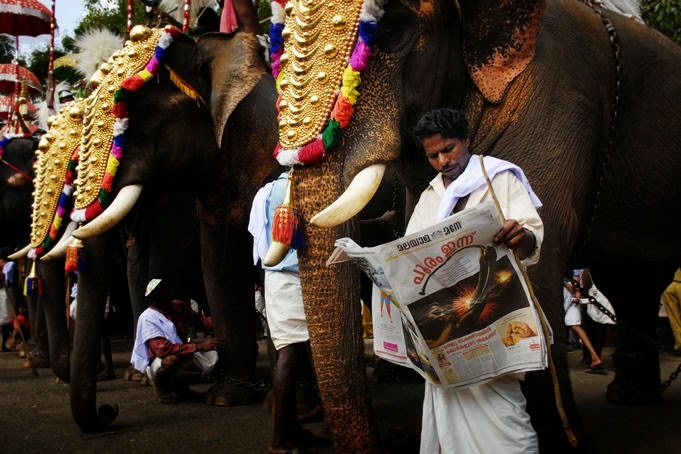 Mahout in serious reading...natural and not a staged scene. Newspaper boys have changed from bicycles to motorcycles these days to deliver in Kochi on par with almost all the blue collared workers!! Taking advantage of the reading habit of Keralites- wherever they are - many local newspapers are either making it available or published not only all over India but overseas as well! In spite of the fact that I read all the English newspapers available in Doha, I used to subscribe Malayalam and English newspapers published from India and read the same for 30 Years! !More than the local news from Kerala/India, I wanted my heart to remain Indian as well since I was sure of returning to mother country one day!! I will not be surprised if any Keralite of my generation in New York or London or Singapore does the same! Kerala is the only state in India where a day- 19 June- each year is observed as the Day of Reading officially by the Govt. Celebration of such a day may be a rarity anywhere.Hundreds of schools and libraries exist through out the state even in the remotest places. The best scene I like in the state- in full length and breadth of it- is in the early morning hours when all the children wearing clean and bright school uniforms hurriedly going to their educational institutions, rain or sunshine no matter!! This scene one can see... whether in the mountain areas,valleys,around backwaters,towns and villages....whether they are from rich, middle class or poor reaching the school in all means of transport or walk ....whether they are from Christian, Hindu or Muslim background!! PS:First photograph is mine and second courtesy to goggle images.